Granulocytes are myeloid cells that play key roles in innate immune responses. They are characterized by the presence of cytoplasmic granules and a poly-lobed nucleus, which gives them the name polymorphonuclear leukocytes (PMN, PML or PMNL). Generated and differentiated in bone marrow, granulocytes have a limited life span once in the periphery and thus, cannot be maintained in culture for prolonged periods of time. They play a well-known role in inflammation and allergy, but are also capable of antigen presentation and immune response modulation (PMID: 23007469). Among the first responders at site of inflammation, granulocytes are equipped with preformed granules filled with an array of potent effector molecules to fight invading pathogens. Interestingly, depending on their activation status and environment, granulocytes have also been implicated in disease. For example, neutrophils can promote tumor growth, modulate their extracellular matrix or enhance tumor angiogenesis (PMID: 26819959, 23485549, 28099862, 27558343). Granulocytes circulate through the body via peripheral blood and can be found in numerous peripheral tissues. However, they are present in such limited numbers that many studies are performed on granulocytes derived from progenitor cells. Miltenyi Biotec provides optimized products to isolate primary granulocytes from various tissues, as well as standardized instruments and reagents to generate granulocytes from progenitor cells. Active role in diseases associated with eosinphilia (asthma, skin diseases, etc.). Granulocytes are divided into three major subtypes: neutrophils, eosinophils and basophils. Granulocyte numbers vary greatly depending on tissue type and on mouse strain, but granulocytes account for approximately 5–9% of peripheral blood cells and 1–2% of spleen cells in mice. In general, granulocytes can be isolated directly from peripheral blood without upfront sample preparation to first generate PBMCs. Other tissues must be gently dissociated to create a single-cell suspension for many downstream applications, including isolation of cell subpopulations, cell culture, or flow cytometry analysis. For details on sample preparation, see related chapters. Miltenyi Biotec has developed numerous products for the magnetic separation of granulocytes. Both positive selection and depletion strategies can be used to isolate granulocytes, depletion is preferred when working with bone marrow, and positive selection when working with other tissues. Ly-6G, a murine lymphocyte antigen 6/urokinase-type plasminogen activator receptor (LU) family member with no human orthologue, is commonly used to identify mouse neutrophils (PMID: 17884993). 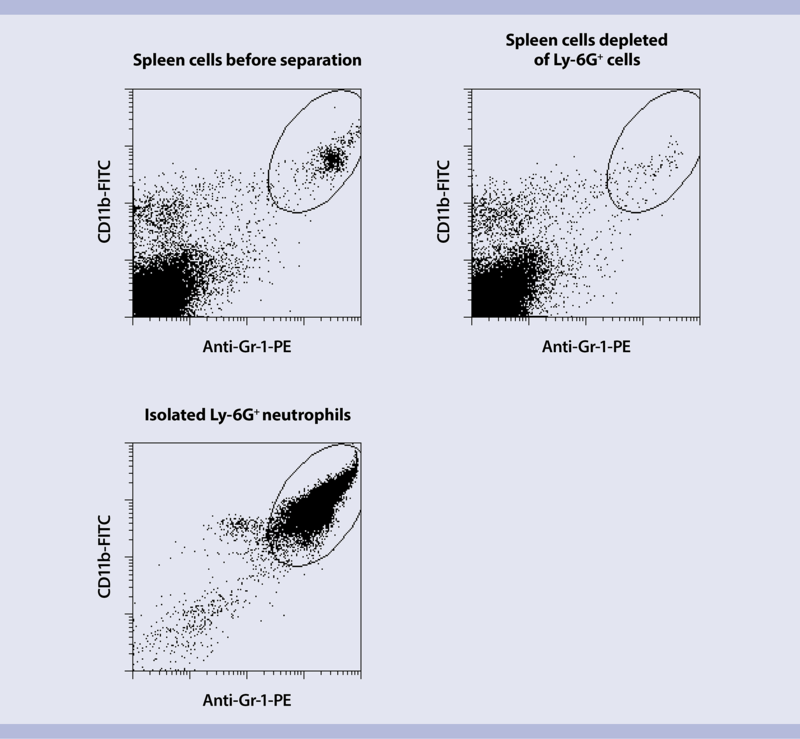 Expression of Ly-6G is not restricted to neutrophils. Some eosinophils and granulocytic myeloid derived suppressor cells (G-MDSC) express it at low levels in various diseases. Miltenyi Biotec offers the Anti-Ly-6G MicroBead Kit, mouse for fast enrichment of functional neutrophils from lymphoid tissues, like spleen. Murine neutrophils isolated from spleen. Ly-6G(1A8)+ cells were isolated from mouse spleen cells using the Anti-Ly-6G MicroBead Kit, two MS Columns and a MiniMACS™ Separator. The cells are fluorescently stained with Anti-Gr-1-PE (clone RB6-8C5) and CD11b-FITC. Cell debris and dead cells were excluded from the analysis based on scatter signals and propidium iodide fluorescence. In contrast to human neutrophils which are easily harvested in large numbers from blood (PMID: 18432834), the small volume of mouse blood makes isolating sufficient numbers of neutrophils to perform downstream analyses rather difficult. Bone marrow is a convenient alternative source of neutrophils and their precursors, both at steady-state under homeostatic conditions and during activation under a variety of infectious and non-infectious inflammatory conditions. Bone marrow neutrophils are functionally similar to blood neutrophils in mice, are reported to survive longer in culture (PMID: 14694182), and can become activated. The number of cells that can be obtained is compatible with the majority of immunological assays and adoptive transfer studies, making bone marrow a useful reservoir for isolating neutrophils in a variety of mouse strains and disease models. The Neutrophil Isolation Kit, mouse enables isolation of untouched neutrophils from bone marrow. Non-target cells are labeled with a cocktail of biotinylated antibodies for subsequent depletion, resulting in a highly pure population of isolated neutrophils, which are viable and ready for functional studies (PMID: 28783679). This kit can also be used to isolate neutrophils from blood cell suspensions. Murine neutrophils isolated from bone marrow. Neutrophils were isolated from C57BL/6 bone marrow cells using the Neutrophil Isolation Kit, mouse, an LS Column, and a MidiMACS™ Separator. Cells were fluorescently stained with Anti-Ly-6G-PE and CD11b-FITC. Cell debris and dead cells were excluded from the analysis based on scatter signals and propidium iodide fluorescence. Under conditions of inflammation, it becomes critical to investigate effector functions of neutrophils at the site of infection. This activity may differ from that of bone marrow neutrophils, driven by factors present in the local immunological microenvironment (PMID: 25033445). With an adapted protocol described by Lionakis et al. (PMID:22916017), Anti-Ly-6G MicroBeads can be used for positive immunomagnetic selection or flow cytometry sorting of neutrophils from mouse kidney, liver, spleen, or other mouse tissues. The magnetically-enriched tissue neutrophils are >90% pure and >95% viable, as determined by flow cytometry analysis. Beside the use of knock-out mouse strains (e.g., Ddb1GATA-1 or MBP-1/EPX mice) to reveal their role in eosinophilic disorders, eosinophils are also isolated from subsequent analysis. Identification of murine eosinophils in most tissues is done by combining the Siglec-F and CD193 (CCR3) markers (PMID: 19178537). Miltenyi Biotec recently launched the Anti-Siglec-F MicroBeads, mouse to enable isolation of eosinophils from different tissues. Noteworthy is that these MicroBeads generate isolates that are a mixture of myeloid cell populations, the composition of which depends on the tissue of origin. Enrichment from blood leads to purely enriched eosinophils, whereas separation from lung enriches eosinophils and alveolar macrophages. Eosinophils isolated from mouse blood and mouse lung tissue. Anti-Siglec-F MicroBeads, two MS Columns, and a MiniMACS Separator were used to isolate eosinophils from mouse blood and mouse lung. Isolation from blood resulted in purely enriched eosinophils, which were stained with Anti-Siglec-F-APC and Gr-1 VioGreen for flow cytometry analysis. Isolation from lung resulted in a mixture of eosinophils and Siglec-F+ alveolar macrophages. These cells were stained with Anti-Siglec-F-PE and CD11c-PE-Vio770 for flow cytometry analysis. Analyses were performed on the MACSQuant® Analyzer, and cell debris and dead cells were excluded based on scatter signals and propidium iodide fluorescence. Equal event numbers are shown for the respective dot plots. The low frequency of eosinophils in mouse tissue has hampered research on these cells, but cell culture protocols developed by Helen Rosenberg (PMID: 20228959) overcome this problem. Starting from complete murine bone marrow, a cell suspension of pure eosinophils can be obtained in a 13-day process using SCF, Flt3-Ligand and IL-5. Granulocytes can be analyzed via flow cytometry using intracellular and surface staining.